bl.uk > Online Gallery Home	> Online exhibitions	> Asia, Pacific and Africa Collections	> Between Phagoo & Theog. Photograph from the Elgin Collection: 'Spring Tours 1894-98', taken by Bourne & Shepherd in the 1860s. View on the road between Fagu and Theog in the foothills of the Himalayan Mountains, showing part of the Hindustan-Tibet caravan route, a tributary of the silk road. 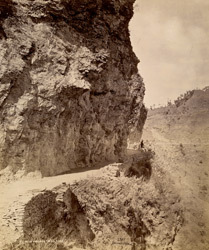 Goods such as dry fruit, precious stones, wool, livestock and spice were carried on this spectacular but difficult road. Mule trains would depart from Sanjauli and cross to Dhalli over the mountains, then pass through the small villages of Fagu and Theog to Narkanda.